Constructs a merge table from the contents of a given binary file. Return the number of entries (ie passbands) per merge record. Return the total number of merged records. Read the merge table from the given binary file. Put merge table in this array of ints. Number of entries (passbands) per merge record. Class to encapsulate the records that make up a "merge table". 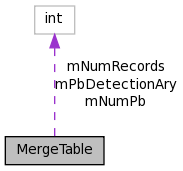 Each record of a merge table gives the records for input passband data which all correspond to the same object as determined from the pairing procedure. Referenced by SourceTable::copyPassband(), and SourceTable::insertAstrometricData(). References Logger::addMessage(), mNumPb, mNumRecords, mPbDetectionAry, and StringOps::NumToString(). Referenced by getEntry(), getNumPassbands(), and read(). Referenced by getNumRecords(), and read(). Referenced by getEntry(), read(), and ~MergeTable().